Big spoiler and speculation alert on this post. Janina Gavankar revealed in an interview with Hollywood Life that Luna’s actions on last season’s finale will have dire consequences. 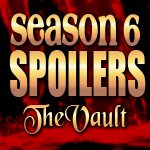 Janina teased that the shifters will experience in season six what vampires had to deal with prior to the series premiere. While Janina doesn’t reveal much about what’s in store for Luna, she did tell about an emotional experience on set with Sam Trammell. Was Sam mourning for Luna in this scene? Luna was in very bad shape at the end of last year’s season finale and rumors are flying around the fandom that she may not have survived her latest skinwalker experience. What do you think? Will Luna survive? I fear for Luna’s safety, it would be such a tragedy if she wasn’t to survive, she’s the perfect woman for Sam. I’m thinking Luna won’t make it. If so, that will be a real shame. She and Sam are wonderful together. Luna’s a great character, but Sam has always been my favourite, so I’m really looking forward to all the drama to unfold. Sam is always at his best as a tortured soul. Roll on June! !